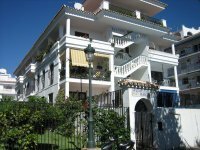 Welcome to our selection of holiday homes to rent in Nerja, Spain. Nerja is the Costa del Sol's most easterly resort, originally a fishing village, Nerja retains much of its original character and charm. Nerja is still a Spanish village at heart, the old part of the town has narrow, winding streets with typical Andalucian whitewashed houses and shops selling local art and craftwork, typical jewellery and local products. Looking for self catering holiday accommodation in Nerja? Then below is a selection of holiday apartments in Nerja and holiday villas in Nerja that can be rented direct from their owners. You can either click on each listing for further details or you can use our search engine on the left if you are looking for something in particular. Church of El Salvador - The Church of El Salvador can be found across from the Balc�n de Europa and nearby where the old guards tower used to stand. It was first built in 1505 but the structure that stands now was not built until the year 1697. During the years 1776 � 1792, it was extended once again. On the front of the church, there are two ceramic plates with one that depicts the history of the church and the other one shows a beautiful and elegant scene. Caves - The Nerja caves are located just three kilometres from the town centre. There are a number of artefacts in which the cave processes such as wall paintings dated back to the Palaeolithic and post-Palaeolithic periods and also contains skeletal remains such as a human skeleton and animal bone fragments, which are believed to have inhabited the caves as far back as 25,000bc. Nerja History Museum - The history museum was opened in March 25th 2011. The museum contains the history from the town of Nerja. The Nerja History Museum contains a range of artifacts from the cave dwellers of the Paleolithic era to the boom years of the 1960's. Nerja was originally a fishing village, now has a much larger population of just over 22,000 and marks the eastern tip of M�laga's Costa del Sol. Nerja has over 16km's of beaches with perfect sand and an amazing clear watered ocean. There is a range of watersports on offer for you to experience such as including water skiing, scuba diving and sailing.